Light has raised a $25M Series B round of funding. All of Light existing investors participated in this round, in addition to new investors Formation 8, which led the round, and StepStone. This brings Light’s total funding to around $35M. The Light camera prototypes are now up and running. The company has doubled the size of its team in the last three months and plans to double it again before the end of the year. "The way Light’s camera technology works is by placing multiple cameras on the back of a phone — around 6 or 11 cameras. Light stitches together all those images with its software to come out with high-resolution photos. Depending on how many cameras the phone maker chooses, it can achieve between 32 megapixels and 52 megapixels. Light’s cameras can also zoom using what’s called folded optics, which is a method of bending light to make the camera’s size requirements more compact. Light can zoom between 70 millimeter and 150mm. The Light module is paired with a Snapdragon application processor from Qualcomm." 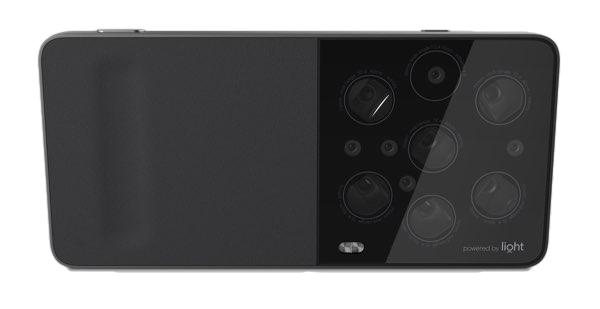 "The build of material costs will be at least $60 for phone makers to add Light’s technology, but [Light CEO] Grannan points out that that’s nothing compared to having to shell out $2,000 for a nice DSLR camera." "Light expects the first phones to come out with its camera will be in 2016." This is a totally apple-orange answer as Light camera module does not offer DSLR capabilities. It is fair however to say the high end camera module may cost $30, so Light's $60 may be justified for the extra performance/benefits. If a high-end camera module cost $30, how can 6~11 cameras cost only $60? Are these "low-end" cameras with an average cost of $5.5~$10? The idea is to use the non-expensive modules, using multiple images, to computationally obtain a 'higher quality' image. Computational imaging can potentially work wonders, but often, it cannot stand pixel peeping kind of scrutiny on image quality (which a DSLR can). It'll be interesting to see what they can come up with. I think that if it truly has DSLR performance, then it certainly is worth the $60 to integrate into cell phones. Of course, the real opinion that matters is from the guy at Apple or Samsung or another phone manufacturer. Regardless, it remains to be seen whether they'll be able to produce DSLR performance, but they're new, so give them the benefit of the doubt. Its discouraging to see repeated claims of these mobile camera technology providers compare to DSLRs. It feels like defensive posturing. You cannot win by making such absurd claims. If it is expensive, let it be and show it can do something worthwhile and there will be market, even if it is limited. Pelican died (in mobile) because they also made such silly claims. They did not die because it was expensive. They just could not deliver a solution that works. The product has to stand on its own merits and if it does well, it will succeed.